The Somerville Station Area and Landfill Vision Plan, created with extensive public participation, will turn a 114 -acre brownfield and commuter parking area into a new neighborhood with a mix of housing types and open space that encourages pedestrian activity and the use of public transportation in an effort to reduce local dependence on automobiles. Located in Somerset County’s vibrant regional business, government, and cultural center and home to one of the busiest rail stations on the Raritan Valley Line, the proposed development will foster social interaction and diversity through a mix of uses, housing types and affordability, public open spaces, green initiatives, and a range of day and evening activities. The compact development will also encourage and support pedestrian, bicycle, and transit activity. The borough will also meet its affordable housing requirement within the redevelopment area, which features 800 to 1,200 new housing units, and create 400 new jobs. Once realized, the redevelopment will function as a natural extension of downtown Somerville and surrounding districts, complementing and supporting the businesses, community, and the train station, while addressing the needs of pedestrian mobility and commuter parking. This impressive plan grew out of an extensive public visioning process. 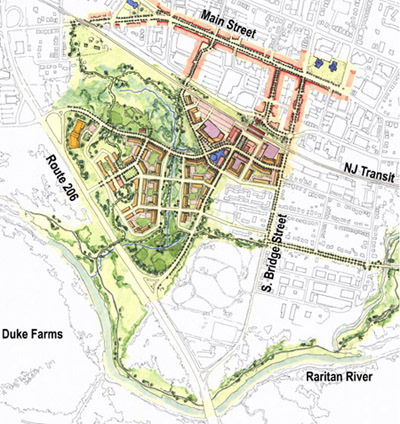 After long-standing stagnancy and lengthy litigation, the Borough of Somerville and NJ TRANSIT decided to capitalize on the landfill’s excellent location and redevelopment potential and in 2005 agreed to move forward with a public process for the site. NJ TRANSIT’s goal is to encourage transit-oriented development in order to promote rail ridership and raise revenue, as well as leverage public investment in the transit infrastructure to attract private investments. The Borough’s objective is to improve the town and increase tax revenue. To ensure that the plan resulted from an open and transparent process based on public consensus, these partners devised a highly interactive and educational outreach process that embraced all interested parties (residents, businesses and the public sector). At participatory meetings and workshops, the Regional Plan Association and other consultants made highly technical information easy to understand and provided economic cost-benefit scenarios to allow the public to actively make appropriate decisions and to weigh revenue-generating land uses against public amenities. The meetings boasted large attendance and enthusiasm and resulted in consensus favoring medium to high densities around the rail station with a significant number of residential units. Key concerns, such as affordable housing, traffic congestion, the parking shortage and business attraction and retention, were addressed. The implementation of the final plan, unanimously adopted by the Borough council in January 2007, will be flexible and phased and initially focus around the train station. The Somerville Vision Plan stands out for the innovative leadership, cooperation, and long-term commitment of its various public partners to advance this multi-faceted project. It serves as a model for how communities can tackle controversial issues and make wise decisions if they have good information, an active hand in shaping decisions, and a clear understanding of the trade-offs, impact, and benefits of those decisions. The plan, with its anticipated transformational effect, holds great promise and will serve as a symbol and catalyst for the town’s revitalization.